Representatives from more than 245 companies filled the Gordon Field House as more than 4,600 students asked and answered questions about possible employment. Representatives from more than 245 companies filled the Gordon Field House as more than 4,600 students—most of them wearing business attire—asked and answered questions about possible employment. Between 1,000 and 1,500 students were expected to meet with employers Thursday for follow-up interviews. Shareef Ali, a fifth-year computer science major from Moorhead, Minn., is seeking a full-time software engineering position after he graduates. He stood in a long line waiting to speak with a representative from Microsoft. “I’d love to work there because it’s one of the biggest companies in the world,” he said. Steve Page ’79 (electrical engineering technology) was among four RIT alumni who came to recruit students for Raymond Corp., a Toyota-owned company near Binghamton, N.Y., that builds forklifts. Page said his company has hired numerous RIT students over the years, starting with co-ops. “It’s a good way to find out how good a person is and if it’s a good fit,” he said. Mathura Raghavan, a master’s student in telecommunications engineering technology who is from India, was seeking her first co-op. She researched the companies attending the fair to find out what they were seeking and planned to chat with representatives from 14 companies. “I’m a bit optimistic. But I still have time. This is only my second semester here,” she said. 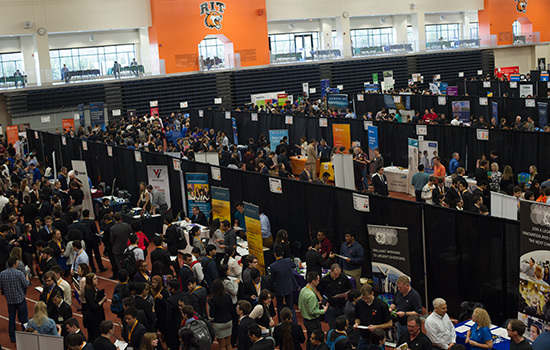 It was the first RIT Career Fair for the New York State Office of Information Technology Services, which sought students for co-ops and full-time positions in information technology and computer security. Brian Powers, a second-year computer engineering major from Vestal, N.Y., stood in a long line waiting to talk with representatives from Harris Corp. Powers said he’d like a co-op in Rochester so he can keep his current housing, and was flexible—he’d consider coding or working as a software engineer, but his preference would be to work with computer hardware. “I’m planning to talk to at least 10 companies here and may apply to a lot more online,” he said. Rachael Thormann, a third-year computational math and computer science major from Williamstown, N.Y., was looking for a co-op for this summer. This was her second career fair—she was offered two co-ops as a result of her first career fair, but she turned them down. She planned to visit about 20 employers. “I probably won’t turn them down this time,” she said. Shin Lutondo, a third-year chemistry major from Elizabeth, N.J., planned to visit four prospective employers, including Johnson & Johnson and Intel, where he hoped he could find a co-op in research and development.